THE US is colder than the surface of Mars and Niagara Falls has turned to ice as temperatures plummet to record-breaking lows — leading to frozen sharks washing up on the beach. It is set to be the coldest New Year in living memory as 220 million Americans wrap up to face lows of -37 degrees Celsius. The crippling cold has brought transit systems grinding to a halt in Boston while there were 30 crashes in one Michigan county alone on Friday morning due to treacherous icy roads. Fountains froze over in New York where New Years Eve partygoers are being warned to lay off the booze and bring some hand warmers to see the famous big ball drop in Times Square as forecasters say it will hit -11C. The National Weather Service has warned of hypothermia and frostbite across the country. A dog in Ohio was found frozen solid on a front porch — while three Atlantic White Sharks have been found frozen solid having been washed up on Cape Cod Bay, Massachusetts over the last three days. 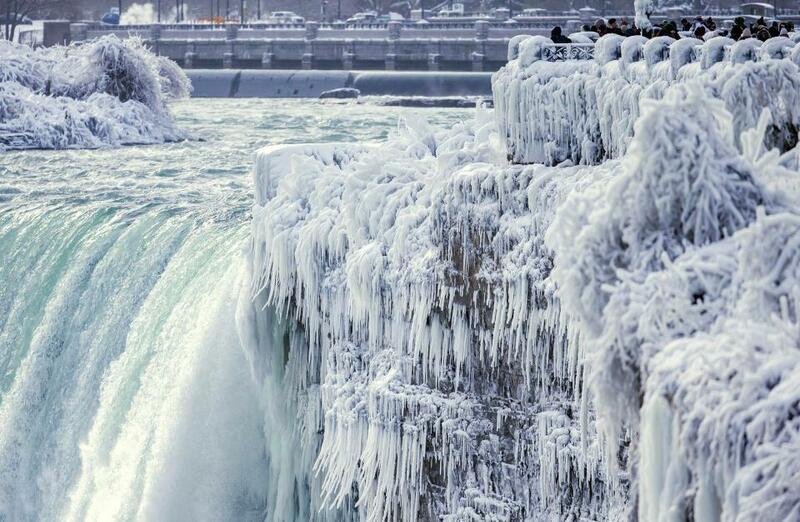 Such is the extreme cold that some parts of the US are chillier than the surface of Mars. Data from the Curiosity Rover, which is roaming the red planet, shows temperatures there reached a comparatively balmy -23C on December 20. 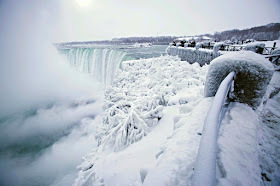 Niagara Falls looked more like Narnia as the landmark which straddles the on the border between New York State and Canada froze over. But the picturesque scenes do not mask the danger as the cold has already been blamed for a handful of deaths.